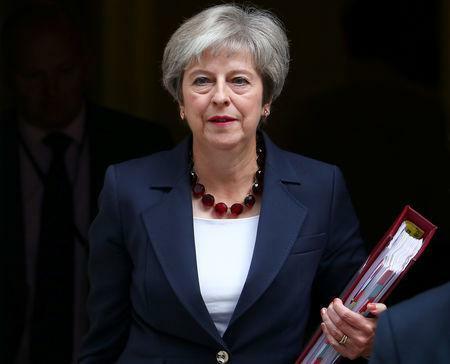 LONDON (Reuters) - Eurosceptic rebels in Britain's ruling party said on Tuesday they would soon produce a "plan B" alternative to a key element of Prime Minister Theresa May's proposal for Brexit, despite pulling the plug on a broader draft circulated last week. Jacob Rees-Mogg, leader of the anti-EU European Research Group (ERG) of lawmakers said his group intends to unveil its proposal on Wednesday for how Britain can leave the EU without constructing a hard border between Northern Ireland and Ireland. The Ireland border question is one of the principal issues holding up a deal between Britain and the EU over Brexit, with less than seven months to go before Britain leaves the bloc. The ERG has faced criticism for attacking May's plans for Britain to remain in a free trade zone for goods with the EU -- known as Chequers for the prime minister's country residence where it was hashed out in July -- but offering no alternative. British newspapers reported that ERG lawmakers had circulated a 140-page alternative plan last week, but had shelved it rather than unveil it. The rift in May's party has turned nastier this week, with her former Foreign Secretary Boris Johnson, who quit the cabinet over the Chequers proposal, comparing May's plan in a newspaper column to putting a "suicide vest" on Britain's constitution. The euro-sceptics complain that accepting free trade on goods with the EU would mean Britain had to sign up to EU regulations even after it leaves the bloc. 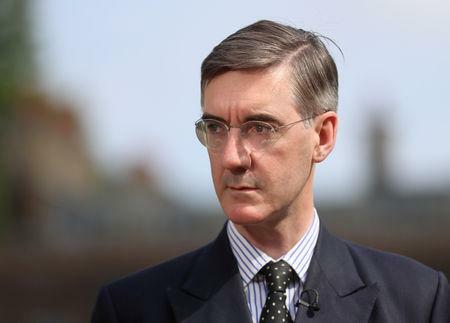 Rees-Mogg appeared on Tuesday at the launch of a report which he said showed that Britain would not face serious harm if it ended up crashing out of the EU with no deal at all. Another pro-Brexit Conservative lawmaker, Andrew Bridgen, said the report showed that Britain could take a tougher position in talks with EU negotiator Michel Barnier. "It's time to tighten the screws on Barnier ... I want to see tears running down his face. They've tried to humiliate the UK to sign up to the disastrous Chequers proposals which effectively leave the UK economy hog-tied and at the mercy of future EU bureaucracy and red tape," he told Reuters. May's government has tried to avoid directly criticising the sceptics in her party, while standing by its position that free trade for goods is necessary both to protect Britain's economy and ensure no hard border between Northern Ireland and Ireland. "There is a lively and ongoing debate taking place and it is clearly a part of that," May's spokesman said of Tuesday's report backed by the euro-sceptics. "Chequers is the only serious, credible and negotiable plan which both delivers on the will of the British people and which prevents the imposition of a hard border in Northern Ireland, and we are hopeful that all MPs will be able to support that." Pro-EU opponents say May's failure to corral restive members of her own party behind her plans shows that the Conservatives have yet to accept reality. Chuka Umunna, an opposition Labour leader of a cross-party parliamentary group seeking closer EU ties, called Tuesday's report "the latest Project Fantasy document from advocates of an ultra-hard Brexit". "Whether it is Theresa May’s car crash Brexit, or Jacob Rees-Mogg’s disastrous no deal Brexit, one thing we know about Brexit is that it is an unholy mess and the gap between what we were promised and the best we can hope for is getting wider every day," Umunna wrote on Twitter.